Home Tags Posts tagged with "fatal accident"
A power plant collapse has killed at least 40 people in China’s Jiangxi province. The accident took place in Fengcheng where a cooling tower was under construction. According to China’s Xinhua news agency, there were a number of people still trapped at the scene. Jiangxi province’s fire services said 32 fire trucks and 212 soldiers had been deployed. A total of 68 people were at the construction site at the time of the accident. Images posted by Chinese media showed iron pipes and concrete slabs lying on the ground inside the large cooling tower. According to Jiangxi Daily, two 550ft-high cooling towers were being built at the site as part of a project to add two 1,000-megawatt coal-fired power units to the power plant. The project will cost 7.67 billion yuan ($1.11 billion) . 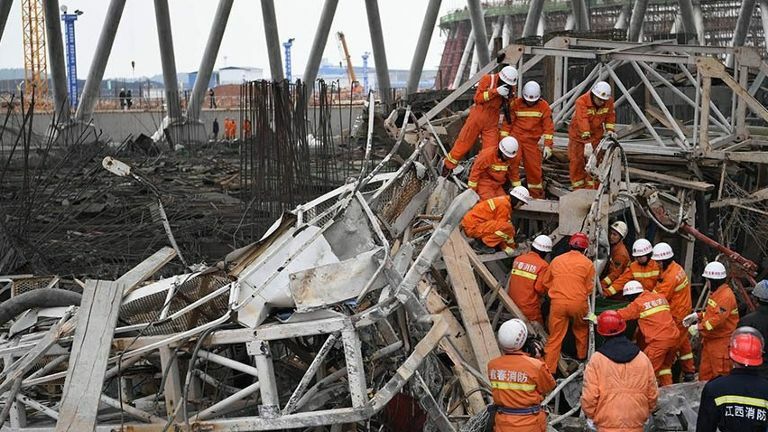 Fatal accidents are common at industrial sites in China and there have been growing demands for more stringent safety standards.